The Athletics Federation of Nigeria (AFN) has granted requests by Blessing Okagbare-Ighoteguonor and Chinwe Okoro to be exempted from the ongoing All-Nigeria Athletics Championships. The two-day National Championships, which also serves as trials for this year’s IAAF World Championships and the All-Africa Games billed for Beijing and Congo Brazzaville respectively, began on Thursday, 30 July at the Warri City stadium. 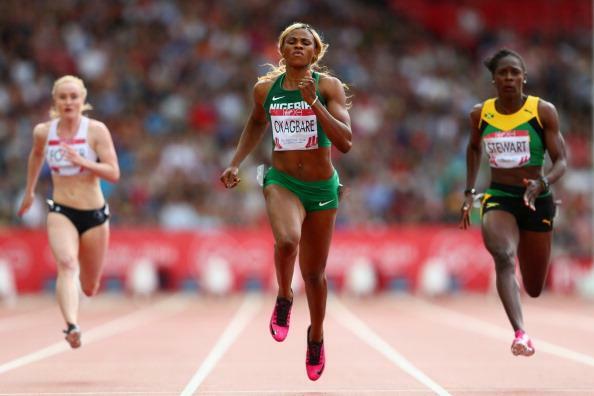 In a letter to the board of the AFN through its medical committee chaired by Professor Ken Anugweje, Okagbare-Igho’s medical team craved the indulgence of the governing body to afford the African sprint queen time to treat a knee injury and abdominal problem. Okagbare, 26, is understood to have opted out of the last Diamond League event prior to the Worlds’ (the Stockholm’s leg) and other competitions so as to ensure full fitness in time for the biennial championship slated for between 22 and 30 August. Okagbare Powers Past Kerron Stewart and Veronica Campbell-Brown in Scotland. Image: Getty. The AFN has also received a separate correspondence from Okoro, 25, who specialises in the Shot Put and Discuss Throw, pleading exemption because the period of the trial coincided with her Master’s degree examination. The request from both athletes have been accepted by the AFN- though after much deliberation. The pair lay claims to automatic qualifications at the World Championships as area champions. The Trophy arrives tomorrow: ABJ, Lasgidi, are you “Ready For? LMC, Clubs, Could Be At Loggerhead Again.